Sometimes a doodle just pops into my mind after hearing/reading a conversation or thinking about a certain thing for a while, plus lots of coffee (LOTS). The above doodle is an example of just that, I was thinking about a tweet chum of mine leaving Liverpool and her twitter avatar happens to be a dragon. Alison Gow is her name and editing is her is game,she is off back to her country of birth, which is Wales. I have been tweet chums with her for ages now. I think she was Grand Poo bah of Liverpool in the tweet stats and that is why I originally began to follow her (no idea really). She is fountain of social media knowledge, with a journalistic twist, as seen in her blog Headline and Deadlines. Alison is also a super nice person and said many a nice thing about the mumborg, which I wont ever forget. I was so pleased to get the chance to meet Alison and hand over the doodle in person. Hopefully she will back soon, then I can doodle a 'Return to Liverpool' piece, with a happy dragon. Baa Wid was conjured up by the mumborg, after she rather quickly and callously cast aside my original idea of 'Widdy the Wool'. In hindsight 'Widdy' leads to Anne Widdecombe on google, so sod that for a monkey's badger, 'Baa Wid' it is. Why a sheep in the first place? It is an homage of sorts, to my heritage,but it mainly pokes fun at the nickname people from round these parts are given. That being said, I could have easily drawn a three headed swamp donkey mutant, if I followed that thinking.. /raises eyebrow at certain people. Who knows where Baa Wid will go next? Who else will crop up? Baa Lee, Ma Baa Wid, Da Baa Wid, GranBaa Wid and GranBaaBaa Wid, are all possibilities.. Yes I am quite mad, ewe can believe that. I would like/love some suggestions, especially from my Liverpoolish chums, about what buildings/places/landmarks, you think are doodle worthy in Liverpool? Where do you think Baa Wid would like to visit? I would, in fact, love input from anyone that has visited Liverpool or wanted to visit. 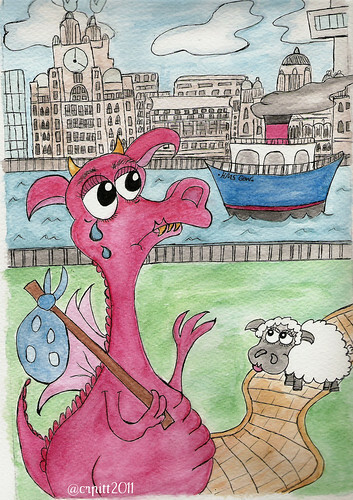 Imagine, if you will, an illustrated guide to Liverpool, from an out of town sheep's perspective ( In the style of above Liverpool waterfrontish dragon doodle). Much obliged for your input as always (preemptive thanks, as I *know* you leave some great suggestions). Coming soon: What do you get if you cross a unicorn/troll/dragon/castle/boat/moon/naked/clothes doodle? 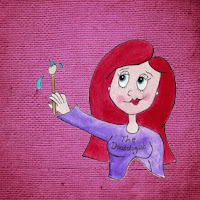 Also check out my wiffling on Twitter, Naked Ladies on Self Exam Doodles with DOODLE GIVE-AWAYS on it's FB PAGE and favourite musical listening on Other Bits and Pieces. I know zip, zero, and zilch when it comes to Liverpool other than the thing that all we Americans know - it's where the Beatles originated. So, how about that night club where the Fab Four got their start? Isn't that still somewhere in Liverpool? I'm grasping at bales of hay here so if I'm totally off, please forgive me! And so now we know where you get your creative bent - it's from the Mumborg herself! Excellent! By the by, if you get tired of doodling Baa Wid you can always start doodling the adventures of the Mumborg - I bet she could really get up to some hijinks if you let her! Loving the phrase Tweet Chum. Sad to see Alison leave Liverpool but thanks to the wonders of Twitter will she ever really be gone? Brilliant character in the shape of Baa Wid. I can definitely see a woolyback adventure in the shape of a pub crawl down Matthew Street, getting progressively worse for wear until they end up in Flannigans, drinking Guinness & singing Irish ditties. Thinking of significant Liverpool landmarks. How about the eagle above the Sony Centre opposite John Lewis. The building is the site of the former Eagle Pub and also the site of the first US Consulate in Liverpool (and first outside America I think), towards the end of the 18th century. The eagle was restored a few years ago and is said to come from an American ship. Aw, Claire, I can honestly say you are - and I suspect always will be - one of the coolest, most honest and kind-hearted people I know. My dragon doodle is dear to me indeed. how about making a doodle of the Baa-Wid, cut it out and send it to your friend and see where Baa ends up? It could be a collaborative project/doodle thing and maybe a children's book? I love how you named the ship after your friend. I love your dragon doodle, it's just gorgeous. I especially love the ship and buildings - not easy to draw! Claire, I sniff a children's book here in the making: The Dragon That Left Liverpool. I've often thought that'd be a great direction for you to go. With your humor, quirky sense of life and language, and imagination I think you'd make a great children's book illustrator and author. "What would a dragon carry in a bindle?" whilst other will be interested in the story behind it (hopefully). As I am not a Fab Four fan I have been reluctant to go down this doodle route, but it is beginning to seem daft not to. You have definitely given me some food for thought and yes the mumborg does seem to think that she is to blame for my doodle creativity, but I am not sure. The fame has already gotten to her head and I am afraid more doodles will only encourage the beast! @adebond: Hey tweet chum! Well it does apply to yourself. True about Alison, she will always be about floating in the tweet aether, which sound a bit creepy, now that I type it, haha. I am pleased that you like Baa Wid! At first I was unsure whether people would get it or like her, but she is doing well so far. Love the pub crawl idea! Maybe she can meet some drunk navy dudes? @Graeme: Hey dude, thanks for popping in. I must say, I rather love your suggestion and have done a wee bit of digging already. @Alison: How dare you besmirch my character in such a way! Oh hang on, you were being nice, in fact far too nice for my liking (wipes away tear). When I started doing the doodle,I did wonder what you would think of me doing it, but your reaction to it has been SO worth it! to it, I couldn't think what it was called. In the end I had to twitter request 'What's another name for a napsack thing'. Claire, you're one in a a very special million! I'm in the same boat as Linda - I know nothing of modern-day Liverpool. And much of what I know comes from trashy period romance novels! Whatever you come up with will be fabulous, of that I am assured! @Gracie, Aww thanks!! Hmm I will have to look for something trashy period romance novel worthy, maybe an epic maritime love tale.